Needless to say, it’s been a very busy past few weeks, and I only have two days left of the photoshoot, so after that, things should appear a bit more normal around here. This week, you’ll get three new recipes and a new video, like usual. It feels good to be back. I’ve been having a blast on set with Evan Sung (the photographer) and his team. 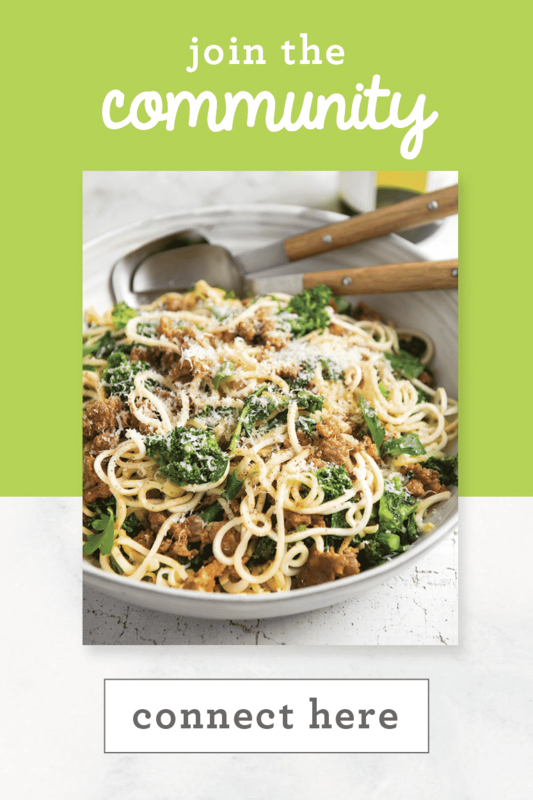 This cookbook is going to be bigger and better than ever! The recipes are my best, the photography is on point, and everything else about it is just perfect. I’m so proud of this book, and I’ve really put my everything into it. 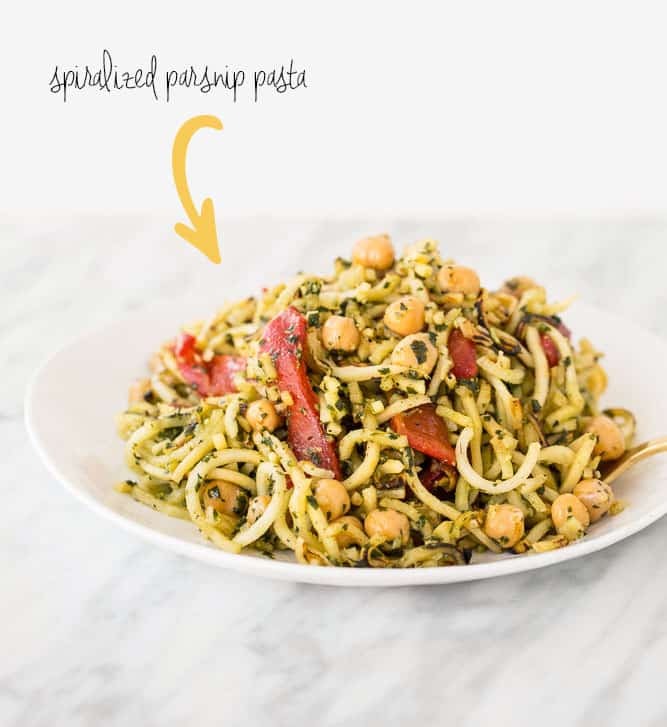 As you know, my Spiralized Specials Menu launched at every Houlihan’s location in the USA on Tuesday – find a location near you! I was featured in the New York Post’s “Eating Right” section – a full two page spread! You can check out the article here. 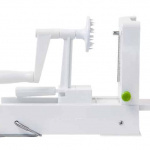 We received our first order from Whole Foods Market for the Inspiralizer (AHHHH!!!! #pinchme) – more to come on that. 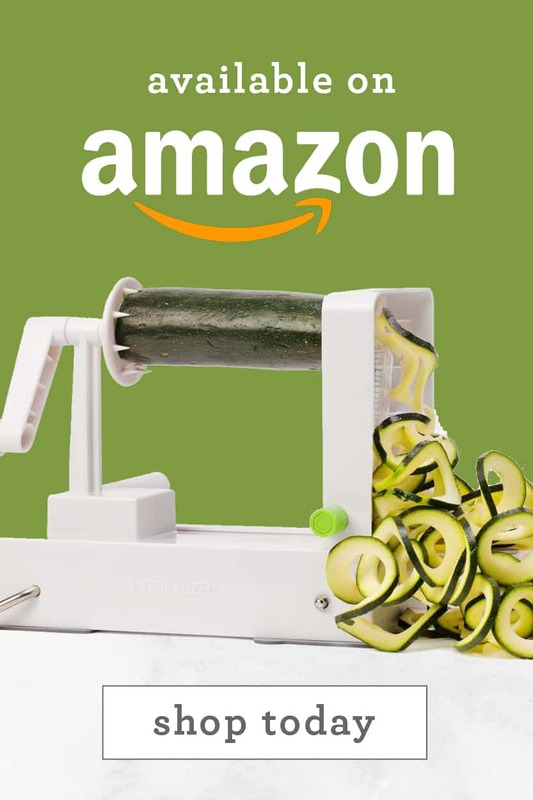 The Inspiralizer is now available on Amazon! 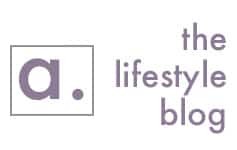 We’ll be Prime Eligible within a week, so make sure you’re subscribed to our newsletter to find out when! Talk about a banner week! The only disappointment about last week is that I only went to the gym once, which is extremely rare for me. It was a very busy week that exhausted me, and I wasn’t disciplined enough to fit the gym in in the mornings. But it’s okay, life happens and now, I’ll be focusing on starting this week off on a healthy note (woke up at 8am this morning and hit the bike)! 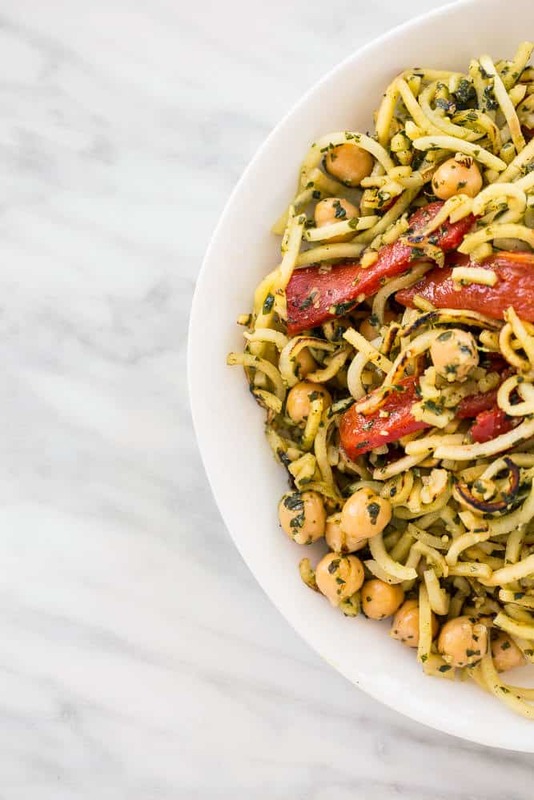 As for this recipe, it’s one of those insanely delicious spiralized meals that takes hardly any time. 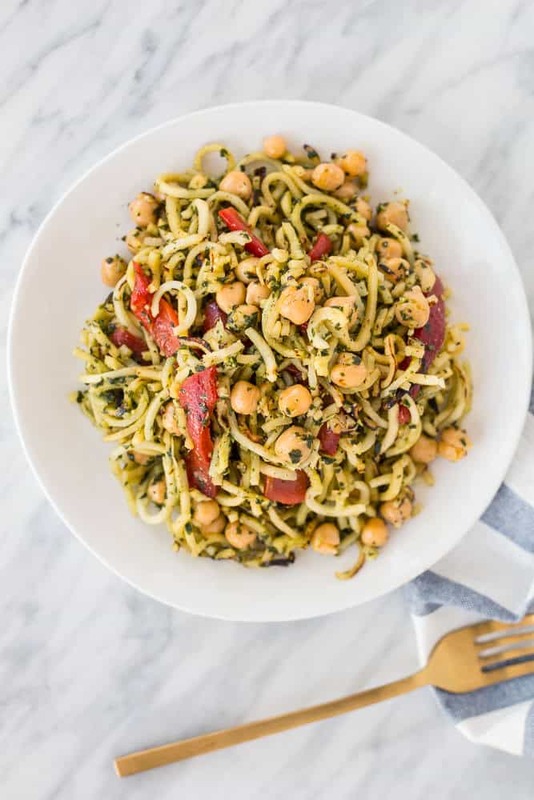 You could even use your favorite jarred pesto sauce, if you don’t want to bother with making your own pesto. One note about parsnip noodles – they break up once they heat in the pan. 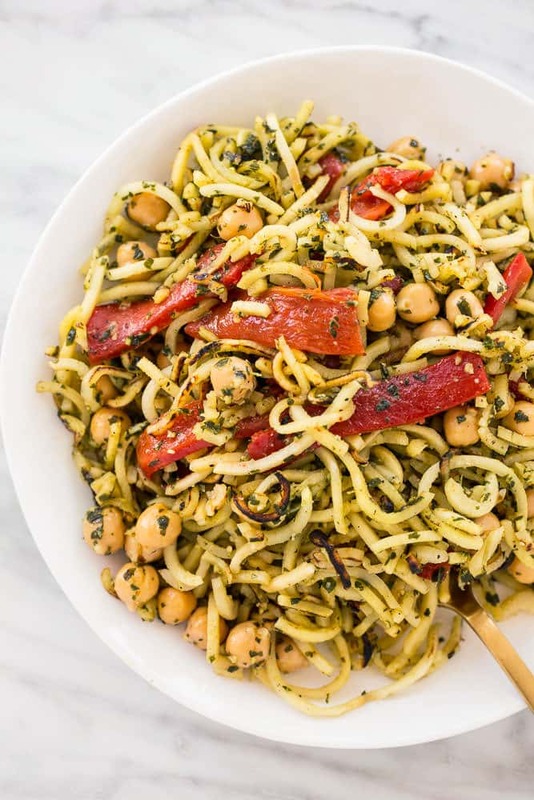 However, the final dish still tastes incredible, so don’t get disappointed if you see your noodles breaking apart – it’s just the nature of spiralized parsnips! By the way, I made this this morning on Snapchat, so follow along – username Inspiralized. 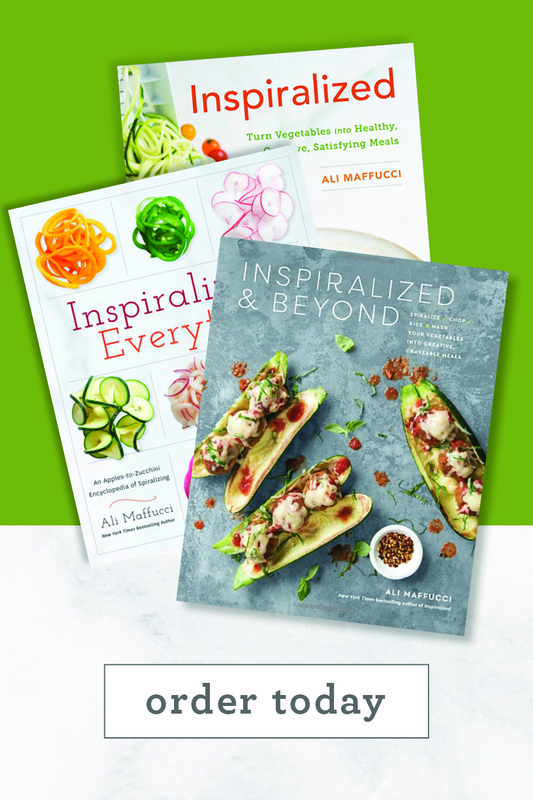 In celebration of the menu launch, Houlihan’s is offering FIVE of my readers a Houlihan’s x Inspiralized basket! In it, you’ll find a grocery list calendar, a beautiful ceramic spoon holder by Anthropologie, a fun dish towel by Anthropologie, an “I’d Spiralize That” t-shirt, and of course, a gift card to Houlihan’s! To enter to win, use the widget below – and goodluck! Giveaway ends Tuesday, February 9th! Place a large skillet over medium-high heat and once it heats, add in the parsnip noodles and season with salt and pepper. Toss and then cover, letting cook for 5-7 minutes or until parsnip noodles are cooked through. Uncover, stir in the red peppers and chickpeas and let cook another 2 minutes or until heated through. Meanwhile, place all of the ingredients for the pesto into a food processor and pulse until creamy. Taste and adjust to your preferences, if necessary. Transfer the mixture to a large bowl and add in the pesto. Toss to combine thoroughly and divide onto two plates. I can't wait to try the lasagna! I think the Thai noodle salad on the houlihans menu sounds amazing. Don't really have a favorite yet to post....but thank you for the opportunity to win ! I'm game for trying all of them!!! Hi, does this serve 2 or 4? 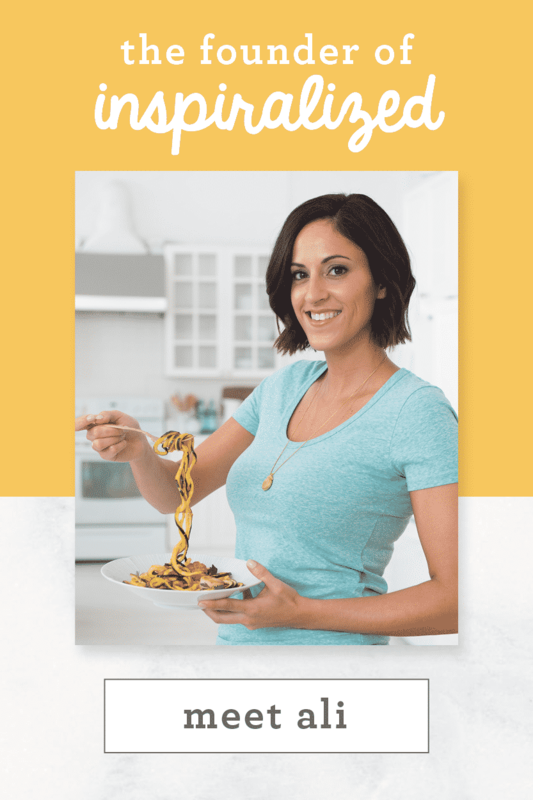 Hi Ali: do you have a bundle package for the Inspitalizer & your cookbook? What is the procedure for ordering from Canada. 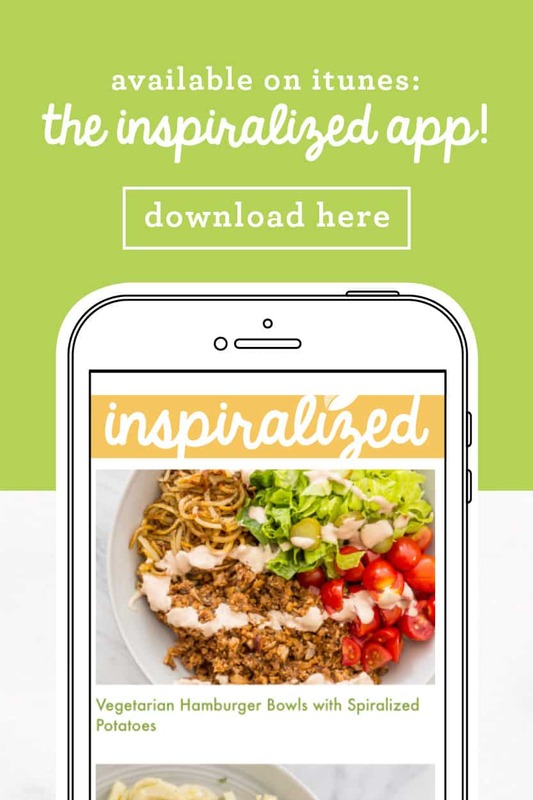 Thanks, love your site & use my Inspiralizer daily! This is for a friend. I would love to try the Butternut Squash & Sausage Lasagna at Houlihan's menu! This looks so good! Can't wait to try, and congrats on everything- you're killin' it! It says to divide into two plates, but in description it says 'Serves 4' ... 2 or 4? In Step 1, is there NO oil or water to cook the parsnip pasta? In all my years parsnip has been boiled, steamed or roasted, . I'd have thought cconut oil at least so the parsnip won't catch . Later today I'll see if local F&V still have the larger diameter parsnips because my imagination is clamouring for those flavours! Love to you Mel! I would love to try the lasagna. It sounds amazing! Gimme that lasagna! Congrats on a super exciting week, Ali! The Thai Noodle Salad sounds awesome!! Would love to try!! Congrats on whole foods and Amazon! Wow, you have been so busy! I've had my inspiralizer for about a month now and I'm addicted. Thank you changing the way I eat for the better! I would love to try: THAI 'NOODLE' SALAD! 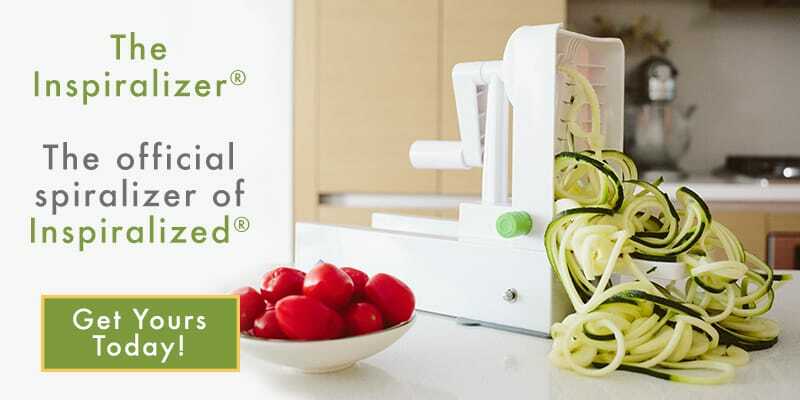 I love my inspiralizer...I use it all the time! I would love to try the Butternut Squash & Sausage Lasagna at Houlihan's! Let us know if you do! We'd love to know what you think. I would love to try the Thai Noodle Salad!--Always a go-to when I have the choice for a night out! Let us know when you give it a try! Someone else asked, but I'll add my own query -- don't you have to cook the parsnips, and then the peppers and chickpeas, in a little oil or something? The instructions seem to indicate they're all cooked in a dry skillet. Is that possible? I'm thrilled about Amazon and will definitely post a review. 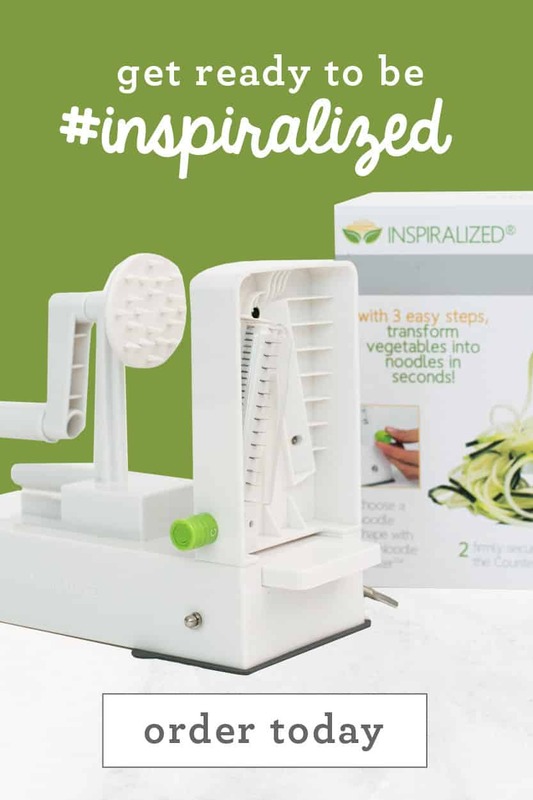 I LOVE my Inspiralizer!! !